My journey began fifteen months ago when I attended a lecture given by Dr Semir Osmanagich at the Megalithomania conference in Glastonbury. The information that Semir presented was powerful. His findings resonated with me in a manner quite apart from any other deep antiquity lecture I had seen. So, trusting my instinct, I set aside the time to visit the Visoko Valley in Bosnia; and participate in the largest (disclosed) archeological excavation currently being undertaken anywhere. When one makes a sincere choice there is no turning back, and what I was about to experience was certainly beyond the scope of conventional intellectual preparedness. Visoko is a town set within the belly of a beautiful valley north of Sarajevo, in mid-Bosnia and Herzegovina. Until the 1990s this region had an unsung record of peace. For nine hundred years minorities persecuted elsewhere could find sanctuary within the modern precincts of Bosnia. Persecuted Jews lived alongside Catholics and Orthodox Christians; Muslims chanted their prayers openly in the knowledge of mutual tolerance and respect. Yet today Bosnia is (unfairly) renowned for the atrocities it suffered under the direction of last generation’s political classes. 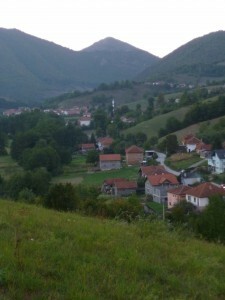 Visoko town suffered disproportionally during the conflict, its position flanked by steep walls made it an easy target for intruding aggressors. Today the mark of war still hangs heavy. Middle aged survivors carry terrible scars, many buildings are still abandoned, seemingly innocuous fields remain littered with mines and on the first day of every month a siren reverberates – mercilessly serving to remind the good people of the town of their past traumas. So it gave me reason to be encouraged when the taxi driver who eagerly picked me up at Sarajevo airport gave his own personal discourse about what an encouraging discovery the five pyramids at Visoko are for a nation lacking in confidence. 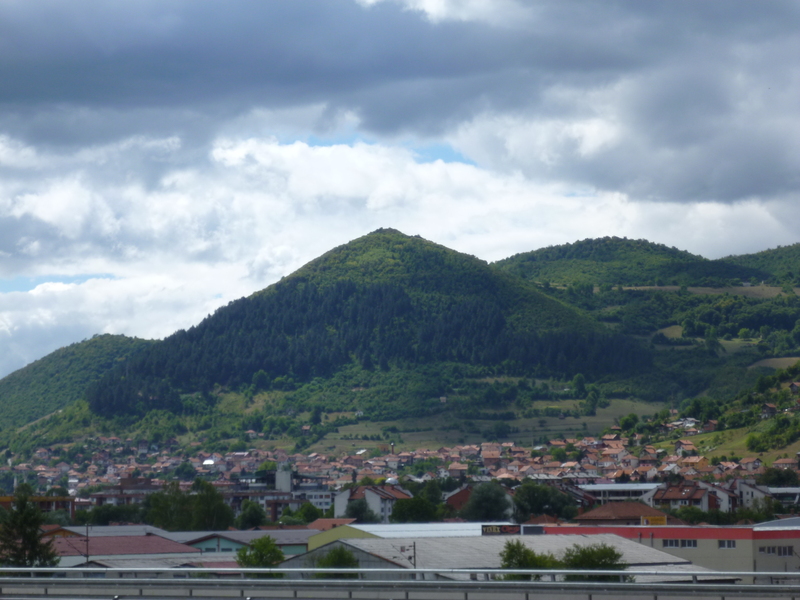 As we approached Visoko, probably at unsafe speed, I indulged his boyish need to race other cars; the tallest of the pyramids, the Pyramid of the Sun, was clearly visible from the dual carriageway. Even at this distance it was impossible not to be awestruck. 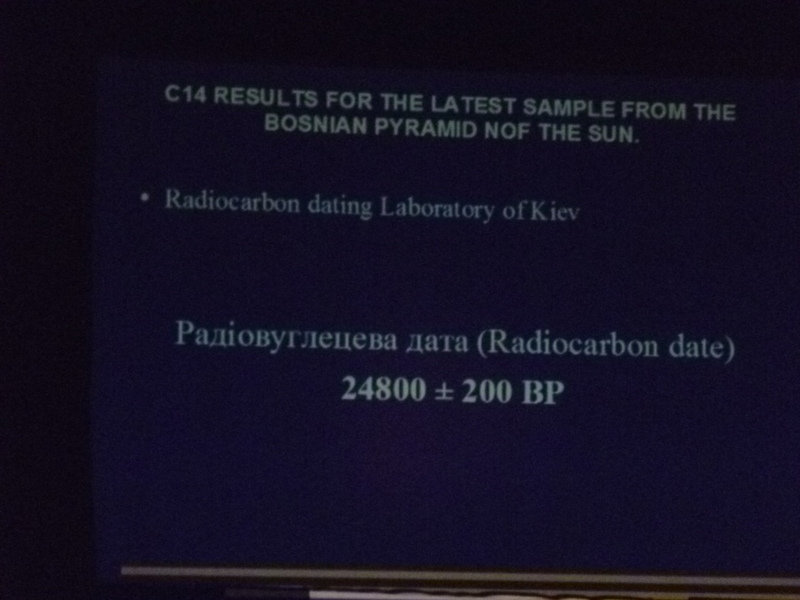 What do we know about Visoko’s Pyramid of the Sun? It is 220m high, which surpasses the Great Pyramid of Giza standing at 147m. The Pyramid of the Sun is correctly orientated toward the cardinal points. The four sides of the Great Pyramid of Giza (Cheops) are orientated with an accuracy of zero degrees and three minutes of arc toward the cosmic north or 0.015pc accuracy (G Hancock). The Pyramid of the Sun sits within zero degrees, zero minutes and twelve seconds! of absolute alignment (Geodetic Institute of Bosnia and Herzegovina). Is this an inexplicable precision? There must have been powerful motives to secure these meticulous orientations and a great deal of skill and execution that would be extremely difficult to replicate today. 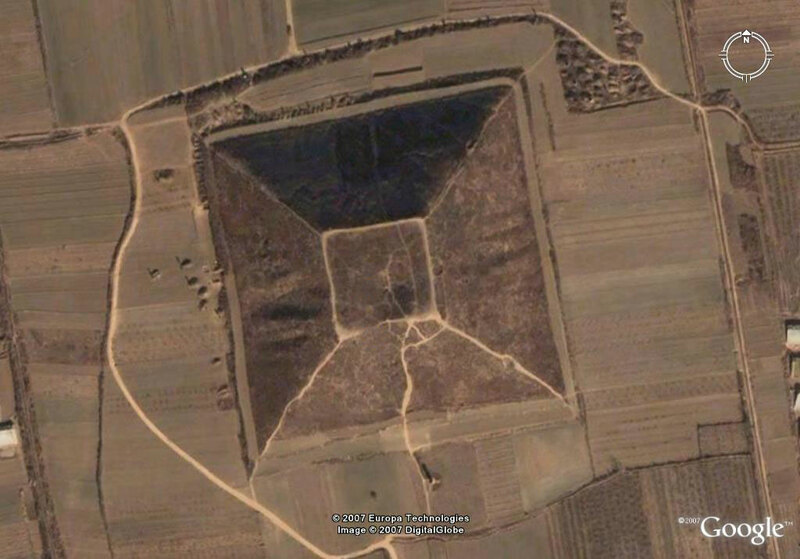 We also know that there are two major aquifers directly underneath this pyramid but before we study more details it is worth taking a step back. 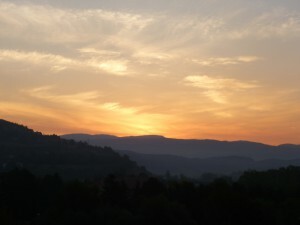 There is a noteworthy interrelationship between three of the pyramids within the valley. Specifically betweem the Pyramid of the Sun, Moon and Dragon. They form the corners of an equilateral triangle. Spaced 2.2km apart, ten times the height of the Sun Pyramid. When one extends and wraps a circle around the triangle, the symbol of principle, the rim touches the entrances to the numerous tunnels precisely. 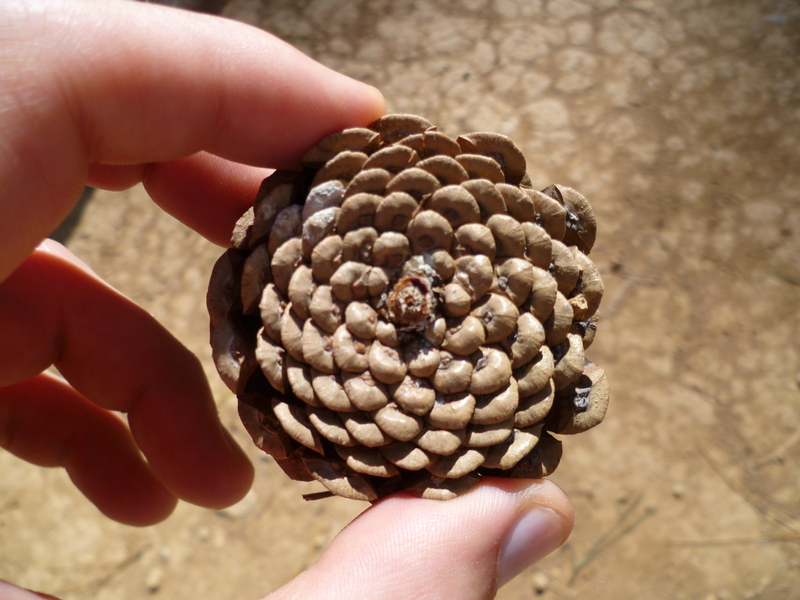 Clearly their position was mapped with more than half an eye on applying the beauty of sacred geometry. 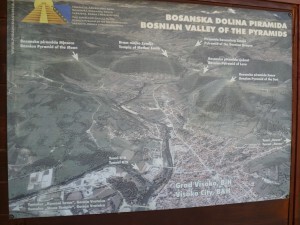 A further triangle is formed by the pyramids of Earth and Love and the River Fojnica. 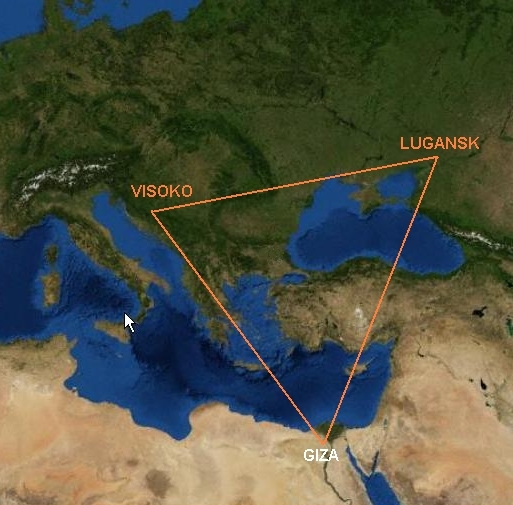 Zooming out one derivative further, it is interesting to note that another equilateral triangle is formed between Visoko, Giza and Lugansk. Lugansk is a Ukrainian sacred site of much interest to the ex-Soviet ruling class (Valery Uvarov is a good source for more information). I will not explore the cosmic alignments here but it is worth bearing in mind that all that which is on Earth must be reflected on in context of Earth’s relationship with the Universe. If you are looking for only one answer, you will never arrive at the right conclusion. With matters of this repercussive magnitude one must be prepared to look holistically and interpret multiple avenues of unsatisfied revelation. However, I will entertain a binary question I have been asked more than any other. Is this, as is claimed, the biggest pyramid on Earth? The response: probably not. 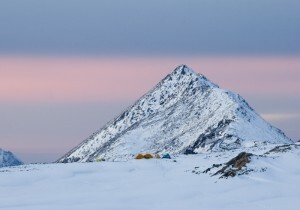 The largest above ground pyramid might be in Greenland (above). It is one of a dozen hair raising reasons why the Russian’s are so purposefully seeking to domineer the North Sea Passage and all adjacent seas – of course the argument is always reduced to linear economics and one can understand why, especially when Russia “bailed out” Iceland from their short-term unfunded liabilities in exchange for shipping rights. 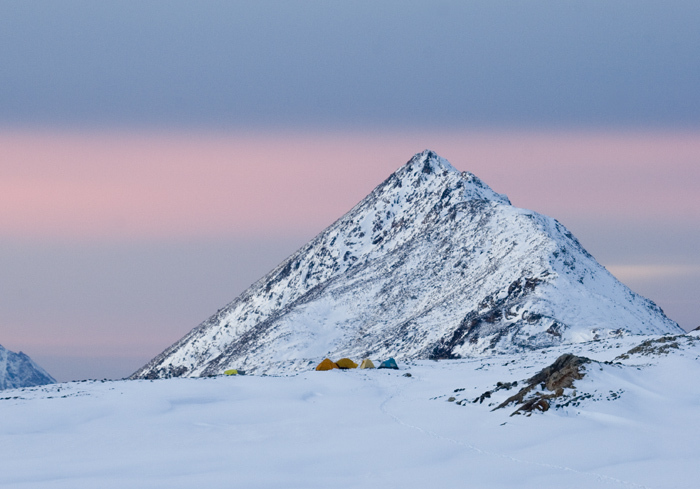 Then there are the growing murmurs of an above ground pyramid in Antarctica. The mainstream accepts that there are pyramids in Bolivia, Guatemala, Honduras, El Salvador, Canary Islands, Mauritus and Sudan. 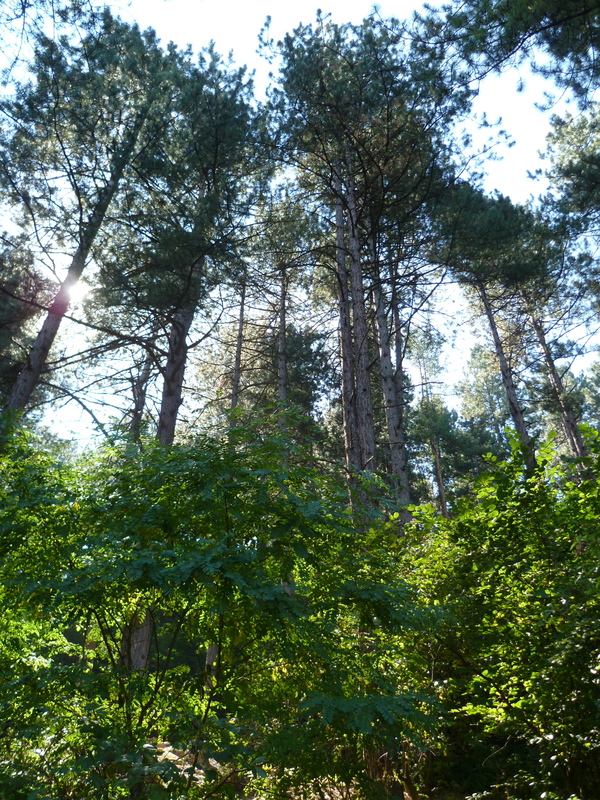 There are bigger complexes in Egypt, Mexico, Peru and China (above) – where there has been a concerted effort to camouflage them with trees (read Hartwig Hausdorf). These bigger complexes also correlate with the cradles of indigenous civilisations that spread out across continents. Hence, it would be a great surprise to not find pyramids in Europe. In 2005 the intrepid Dr Semir Osmanagich formally disclosed the significance of the Visoko Valley. Since then there has been a steady effort to better understand the vast historical implications by meaningfully excavating multiple sites. The early findings support the authenticity of these artificial structures. 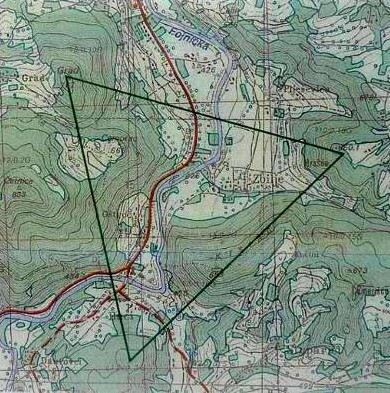 It is interesting to note that the trees’ roots have not penetrated the pyramid and have only spread out laterally. As anyone with a tree in their garden will know, roots can devastate structures effortlessly and quickly. They do so by secreting an acid that burns a tinny burrow in the hardest of materials and once the attritional holes have been forged, hair sizes roots penetrate and grow, expanding like water into ice and breaking the material from the inside out; at which point a tree’s will dominates. But on the pyramid of the Sun the trees’ roots have at best only hooked themselves into a most superficial surface. The slabs that layer the pyramid are composed of a hard concrete. It is commonly accepted that the Assyrians and Babylonians used clay as a bonding substance. The Egyptians used lime and gypsum cement. In 1756, British engineer, John Smeaton made the first modern concrete (hydraulic cement) by adding pebbles as a coarse aggregate and mixing powdered brick into the cement. Cement with these aggregate characteristics but harder than today’s concrete, is what is found on the Pyramid of the Sun. On the surface two thick layers glued together with a layer of Babylonian-esque clay. Some sections appear to be formal blocks, other sections probably poured. Once the surface is totally uncovered and the absolute contours revealed, the rationale for the variation will be evident to all. Dr Joseph Davidovits (for those who need him introducing: founder of French Institute of Polymers; authored more than fifty patents; published ten books on the construction of the pyramids and holder of French Medal of Merit) has named the blocks “geopolymer cemented concrete.” His research and finding were complemented by analysis from the Department of Chemistry at the Institute of Turin (which specialises in material science). At exactly one third and two thirds level there is a ribbon of concentrated magnetite, the most magnetic of all the naturally occurring minerals on Earth. Scratching the surface of this single monument, I soon realised that I was not only embarking on a journey of material archeology but in reverse engineering the advanced process of the designer, a journey of consciousness. The reason why these individuals have since recoiled but, in most cases, not publicly amended their positions is a fascinating and self-contained case study of fear based sociology. Fear of losing provision, fear of isolation and perhaps a fear of confronting an unsettling version of history. Since it became a standardised academic discipline, dead to lively research, Egyptology has been castrated. The lazy and quite laughable notion that the Pyramids in Giza were tombs floods a forest of knowledge like the acidic waters trapped behind a dam. In trivialising the mystery the ancillary establishment, who possibly only sought untapped capital hoards originally, certainly got more than they bargained for and were soon treading the same path as the remorseless Inquisitors and Nazi covert expeditions of the past. Let us remember that the pyramids of Egypt cannot be dated because radiocarbon dating methods are not applicable to stone and that the hydro erosion implies a date pre-12,000 years. 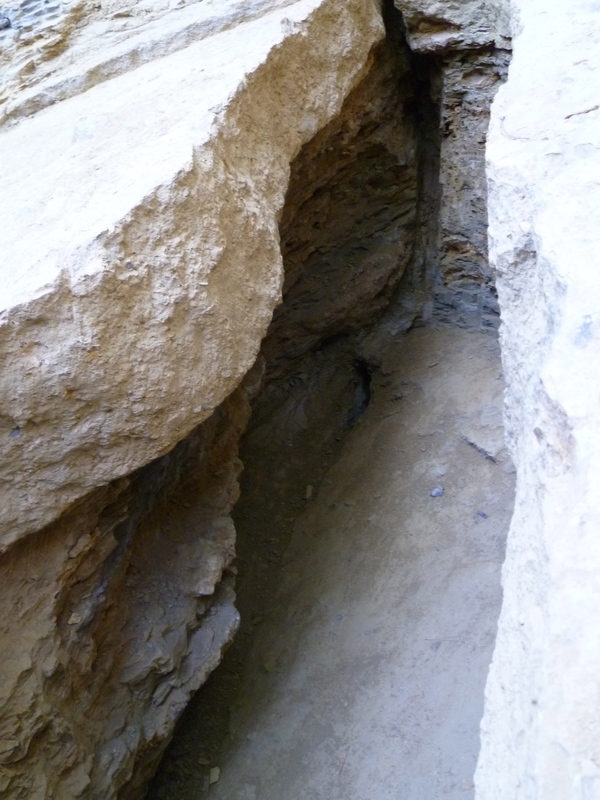 As a side note, it is always amusing that the majority of Egyptologist interpret the pyramid complex’s stone irrigation channels as superfluous anomalies. Let us also remember that the media-friendly Mummies were found in the Valley of the Kings, not inside any pyramids, within which there is next to no artwork. It is a highly tenuous argument to suggest that the pyramids of Egypt are directly associated with the documented Egyptian Pharaohs. This valley certainly raises the hackles of orthodox Egyptologists, who are still hiding in the muddied waters trodden by the looters transcending all social classes. Yet there is a guide rope, frayed in places that offers help to those who seek truth; the tunnel networks. Tunnels, as El-Rassul disclosed years ago about Egypt, which connect all the tombs beneath valley. A network that partially mimic those on the plateau, where they might have once led to the Great Library of Alexandria (as outlined by the first historian, Herodotus). The Egyptian valley tunnel network was how the machiavellian Carter was able to operate invisible to those on the surface, win the sponsorship of Carnarvon and stun the world with a Tutankhamun shaped magic trick. 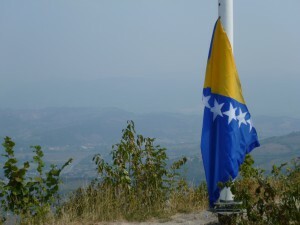 However, in the Bosnian valley there is no looting or honour sought. No overriding motivation toward higher social status or guarantee of multi-layered dynastical wealth but instead a physical journey toward truth. Only in this environment can volunteers with sincere interest be accepted on site rather than paid for labourers. 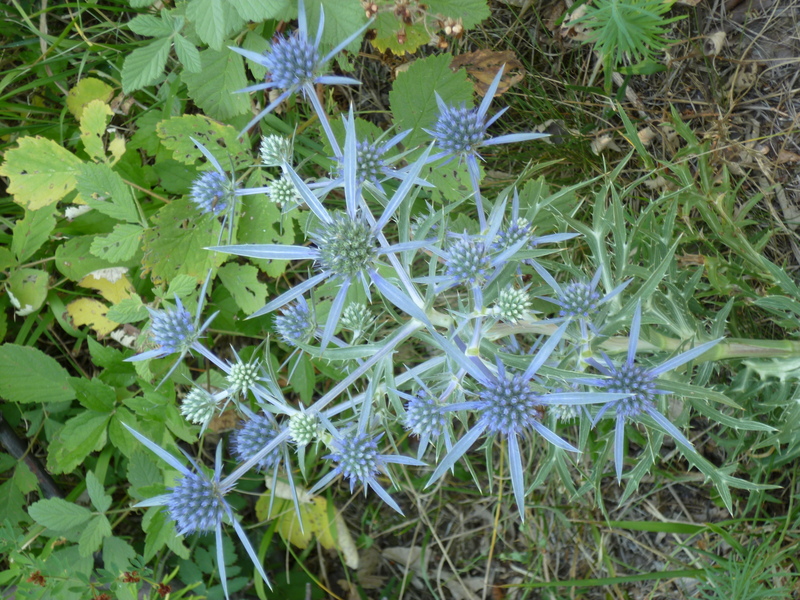 If we are truly to evolve properly, like a flower turns toward the light, we must have a grasp on our pre-history. Concerted efforts to remove knowledge, especially during the dark ages and confiscation of sources by institutions will be rendered futile by the sword of time. 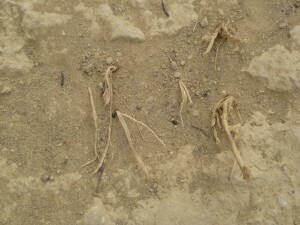 Institutional administrators and activists, the same self-certified learned individuals turn to feast on the overflowing troughs of ignorance, will wilt under the rays of “Maat.” Since in withholding of any knowledge comes an equal energy that eats away at the captor and this is now consuming the final energetic stratum of all intellectual gaolers. The guiding maxim of Sigmund Freud was to seek and dispense truth, echoing pharaonic concept of Maat (truth, justice, and cosmic order – represented in wonderful tomb paintings of a human heart being weighed on scales of justice by Anubis). Anyone looking for total trust is fixed on a journey where embarrassing someone is unavoidable. In Freud’s latter years he studied Egypt and concurred with the finding outlined by O’Farrell that Carter and Carnarvon unearthed writing on papyri that undermined some of the most well defined and documented middle history. That Moses was originally a prince or leader of Egyptian hierarchy. Of course this does not tell us abour our pre-histoy ancestors but does offer a glimpse into how even one alteration in detail could lead to unthinkable recalibrations of justifications and lead to titanic consequences. Moses the “liberator of the Israelites,” the catalyst for their religion and laws – originally an Egyptian, an aide to Akhenaten?! In modern times this would have obvious repercusions for the Israeli state, planted by agents of the British state, who are naturally closely entangled with Carnarvon. Was the suppression of this kind of information the source of the Tutankhamun curse? Or was the source simply the black market hoarding of antiquities? Who really knows what has been raided and lost. 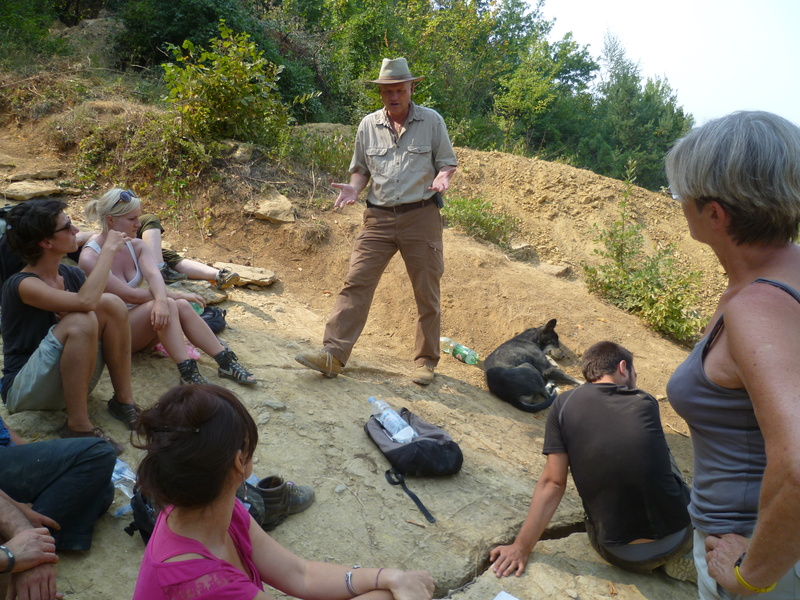 At the excavations of Visoko there is a higher degree of integrity in the format of self-organised and self-regulated excavations, which are led by the professional hands of archeologists and moderated by physicists, geologists, anthropologist etc representing each corner of the globe. The bedrock, a steady team of fifty to seventy-five volunteers working at any one time during the Spring and Summer months. 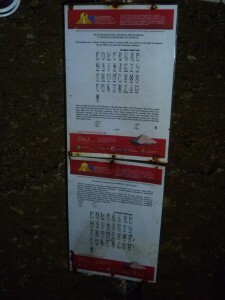 Visoko’s Ravne tunnel network extends fifty kilometres. There are parts still well preserved with artifacts such as oil lamps but it are the sections that are blocked, which offer one of the most crucial narratives. The tunnels are blocked with elegantly smoothed pebbles of irregular types. 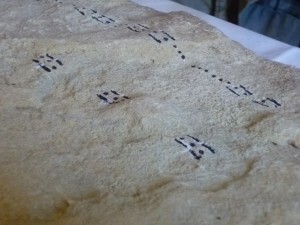 Experts have postulated that the tunnels were blocked by an intermediary civilisation, either inside-out or vice versa. 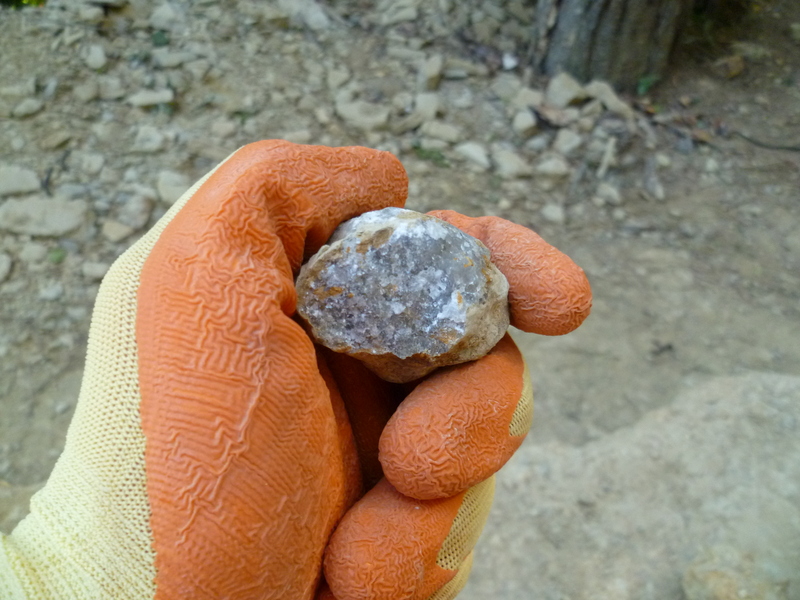 Yet it seems to me that the enigmatic pebble rubble being excavated is akin to river bedrock. It would make a whole lot of sense to deduce that these tunnels were flooded. The ceilings of the inverted “V” shaped tunnels range in height, almost in a wave, which structurally stimulates airflow. The air throughout the tunnels is as fresh as mint and the ventilation is remarkable; counterintuitively the air seems more abundant the further one walks in. Of course dozens of peer-regulated scientific tests have been performed within the tunnels and the results are unsurprisingly eye-catching. There is absolutely zero radiation for instance, which is a massive anomaly and implies a radiation shielding. 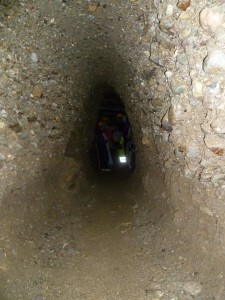 Also, earlier in the year there was a 4.5 earthquake nearby totally undetectable within the tunnels. Whilst inside, one is always confronted with an ancient feeling, as if by being inside the arteries of a celestial beast. That ancient feeling cannot be measured but the impact of time spent in the tunnels on aura can. Engineer Janez Pelko, used technology developed by Russians to measure aura – interesting to note that it is Russian universities who publicly disclose techniques of measuring aura, not revered Western institutions despite the west’s middle-class fascination with body language. Pelko’s latest statistics demonstrate that 85% of people who visit the tunnels leave with improved aura. This makes a lot of sense when paired with the knowledge of the massive negative ion concentration. Modern medicine is catching up to understand the great healing properties of negative ions, so easily accessible even by just heating salt crystals. Inside the tunnels there are many mesmerising artifacts, particularly the mega ceramics. 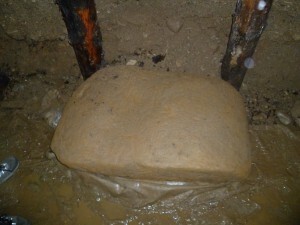 There is one eight ton ceramic block that under x-ray revealed an iron deposit. Many bear runic style inscription. The one above reads “Pay attention (/ beware of) wag.” Although unfortunately we do not know what “wag” is. 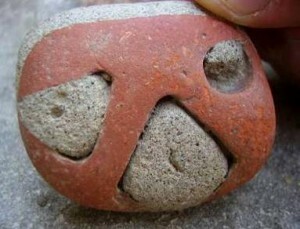 The stone pictured below was activated by light worker Jolanda Klassen. And here is a video, which captured that moment. 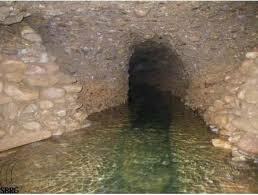 Water also livens up the tunnels and is intriguing in its own right because it does not settle at the level of the water table.The dynamics it demonstrates are closely related to those extrapolated by Schauberger physics. 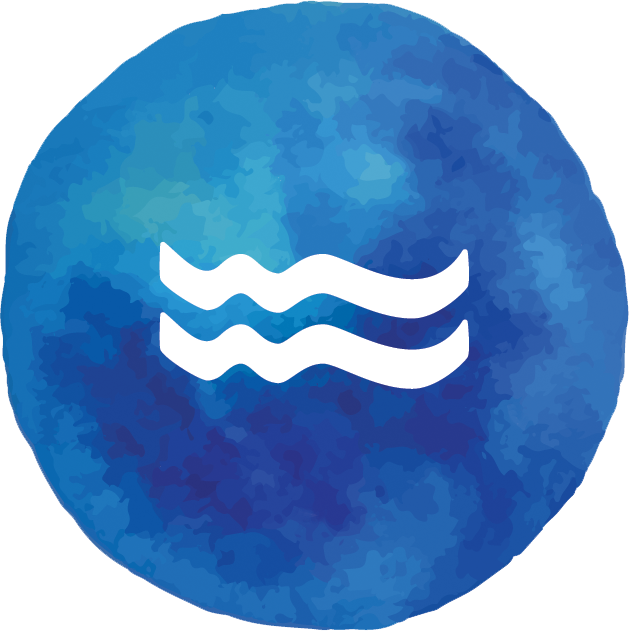 When measured using the Antoine Bovis scale – measuring the energy in nature ie water. The reading surpass those of the well of Fatima, supposedly the highest concentration found in Europe but not the strength of the water Klaus Dona found in La Mana, Ecuador which was 1,000x stronger than Fatima at 1.5million Bovis, with gold and silver colloidal content. Nonetheless, the Ravne waters are hugely exciting and I am in no doubt positively branded, with startling Masaru Emoto style water memory. During his visit last year, Pedro Cruz Garcia, a venerable Mayan elder, gave an informal speech declaring his thoughts on Ravne and other pearls of wisdom (click here). 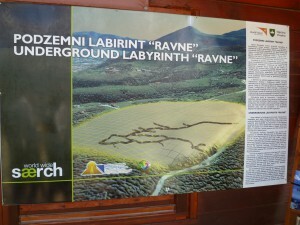 The Ravne tunnels are located at the foot of the Pyramid of the Sun. 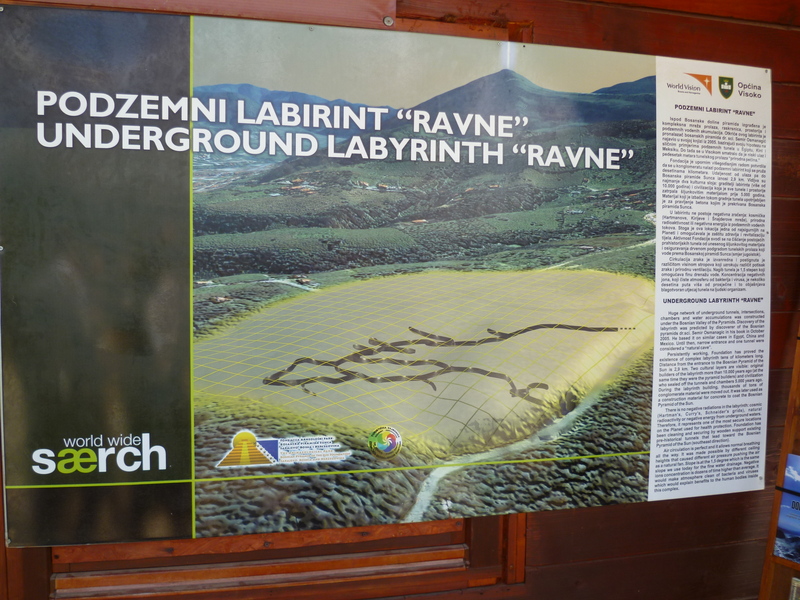 There is even a direct tunnel that runs over two kilometres to the Pyramid; this tunnel is currently being excavated. 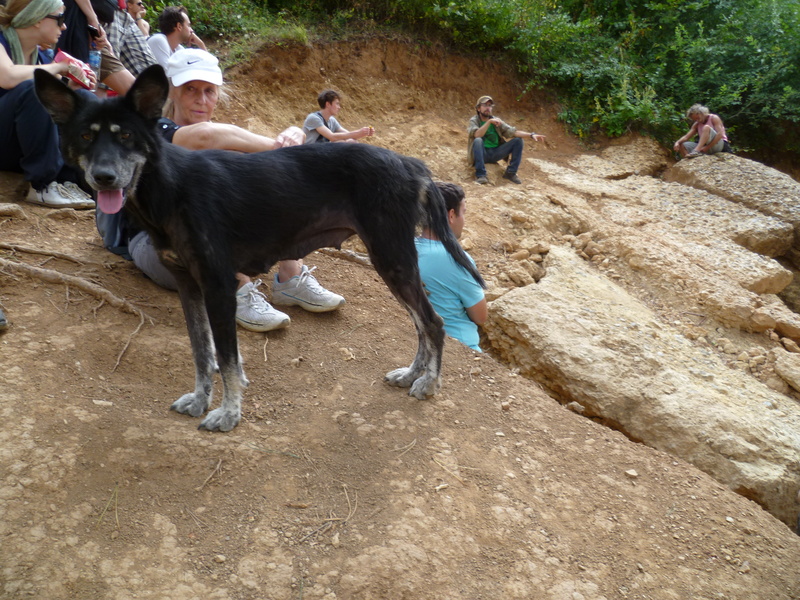 The current state of the Visoko valley and the Ravne tunnels tell a story of a past time where all but the most robust monuments were washed away by a cataclysmic flood. Indeed, Visko is one of thousands of sites that echo the same message. The Bay of Cambay in India (below) is one that has been brought into sharp focus by the marine archaeologist SR Rao, whose team has retrieved thousands of artifacts from the submerged artificial structures. 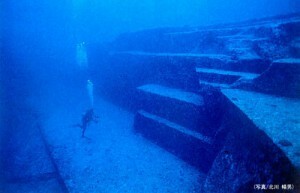 This is similar to what has been found by technical divers in Sidi Gaber (Alexandria) and the Yonaguni Monuments (Japan). 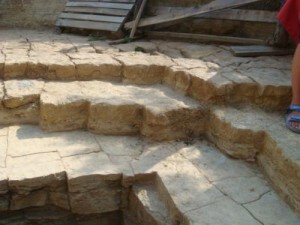 The Yonaguni megaliths (below) were embarrassingly unrecognised by orthodox archaeologists, who are now confronted by the insuppressible eye-witness reports from regular peoples who saw the flooded city landscape, including the stepped amphitheatre, when the waters receded preceding the 2011 tsunami. Massaaki Kimura, the lead authority on Yonaguni has endured many issues with other seemingly intellegent acedmics who cannot deal with the weight of mounting evidence. 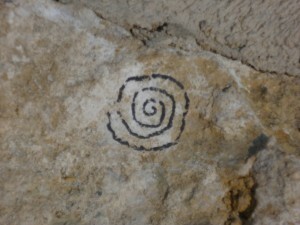 Even the graphically documented colosseumesque monument, which they are claiming is natural. Time for some discernment? Discernment only? Maybe also humility and grace. These attributes we assume are common but we rarely pay them attention they deserve and require. So called “authorities” who have dedicated their adult lives in subservience to institutions rarely possess the strength to withstand even the mildest of attacks by peers or the even partial withdrawal of the hand that feeds them. At times it is agonising to witness the soft yet brutish remit of that which is closed minded, reductionist and reinforcing a way of understanding that undermines humanity’s ability to thrive. May they be filled with renewed discernment, humility and grace. 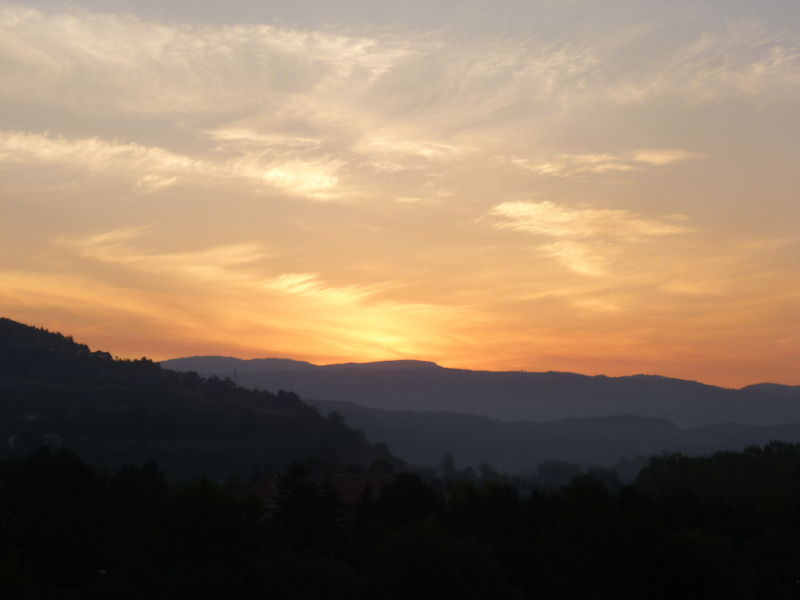 My two week journey in Bosnia began in late August, by which time the extreme temperatures had settled from their peak of forty degrees to low thirties. When I arrived at the motel I was overwhelmed with the thought “what on Earth am I doing here? 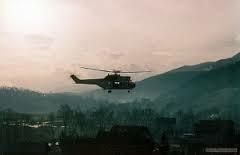 !” It was quite surreal to be located in a town, which even in the first moments revealed itself to operate on sponteneity and not dependable physical or social infrastucture. 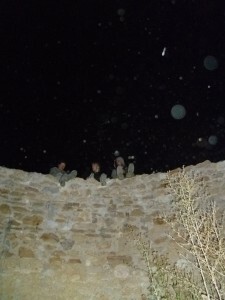 In order to quell any hesitations regarding my participation, which were only fuelled by fatigue, I set my sights on visiting one of the sites. So I walked twenty minutes to the foot of the unavoidable Pyramid of the Sun and decided to climb it. Despite the recent moderation in heat, walking up the zig-zagging path of the pyramid was sweltering. There is a single lane that runs ninety percent of the way up the pyramid and then one must scramble to the top on an improvised, loose path. On reaching the summit, any reservations were now a distant memory and I was encouraged by a rejuvenating urge to discover more. I was one of fifty or so volunteers participating in this year’s seventh shift. In total about five hundred volunteers from fifty-two countries will have made the journey to the largest disclosed excavation on Earth at this time. The range of volunteers is impressive, representing as many professions and interests as countries. The shift I was a member of was a special group with tremendous light energy and decent will toward the betterment of our civilisation. 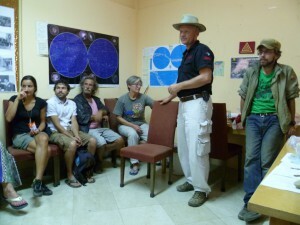 Before we were allocated roles, we had an extensive briefing, covering the history of this excavation, archeological methodology and the approach aspired to – specifically working in an open-sourced manner, which although intuitively productive, a pioneering style within archaeology and refreshingly built of mutual, respect, trust and devoid of excess ego. 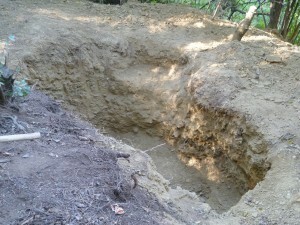 At the time of arriving at Visoko, there were twelve active excavations being undertaken. 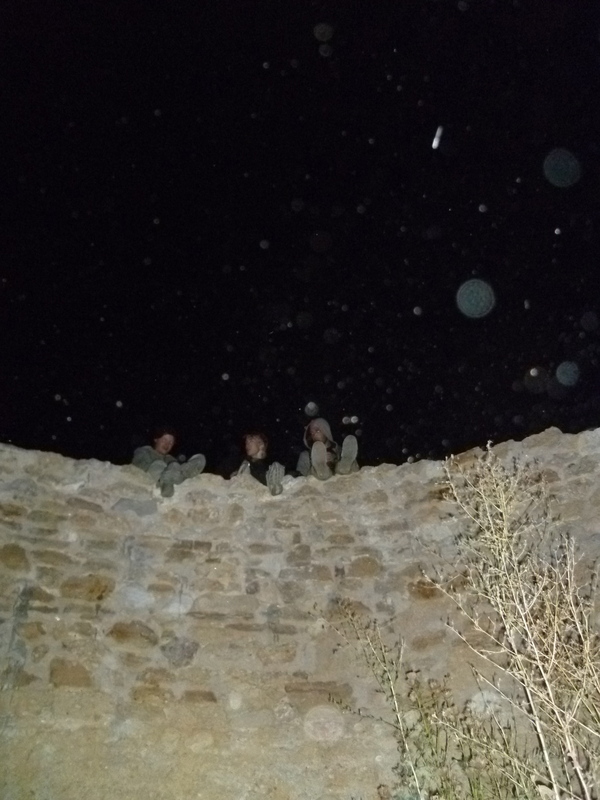 I was delighted to learn that I was assigned to work in a small team on a specialist site on the Pyramid of the Sun. The site’s designation was 12-B and originally opened and targeted after a series of complementary data findings. One was sourced by the renowned out-of-place artifacts archeologist and curator Klaus Dona. To view a video with him at 12-B last year click here. 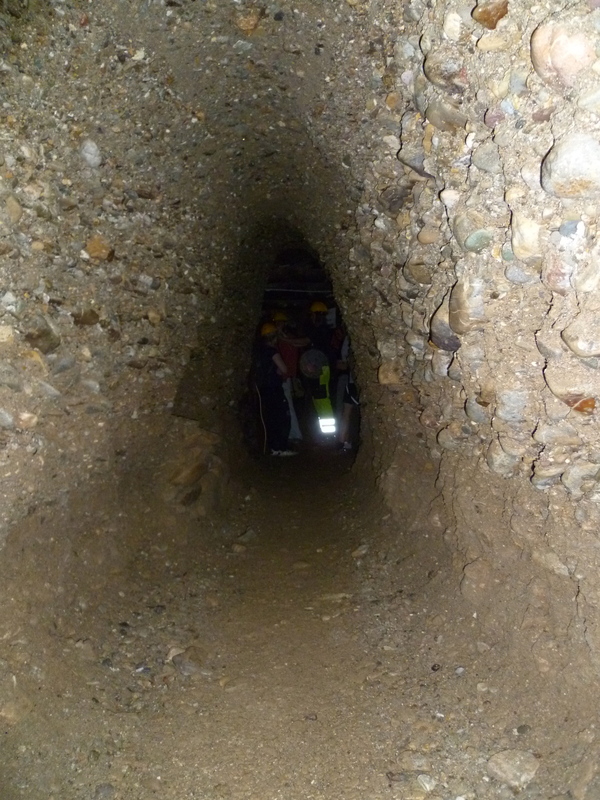 Four metres below the surface of the particularly deep sediment there was a tunnel entrance detectable by ground-penetrating georadar. The access made easier by a fracture. On arriving, this fracture had been cracked and a cavity was made between the two concrete layers. The second layer had a crack wide enough to send a camera through to investigate and verify the information gathered by technologies. 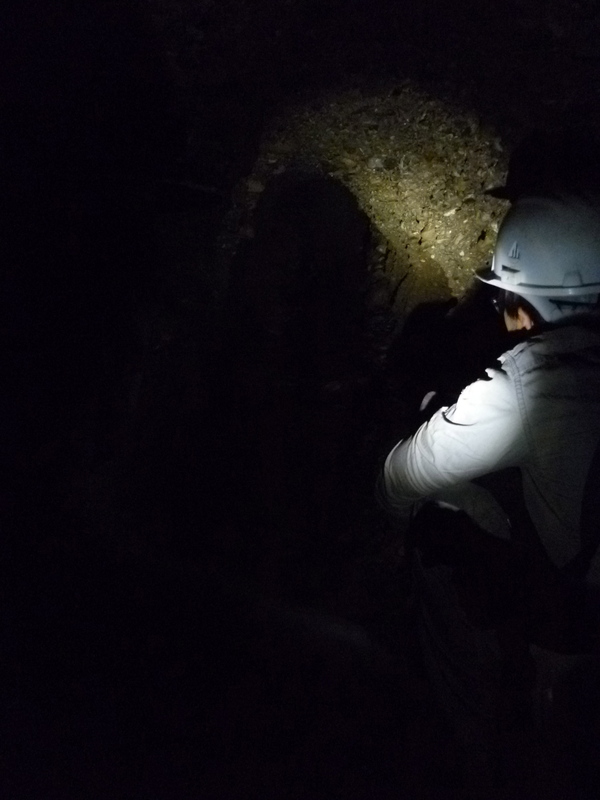 The camera was able to confirm that this was the entrance to a walled shaft that descended 70 metres into a chamber. 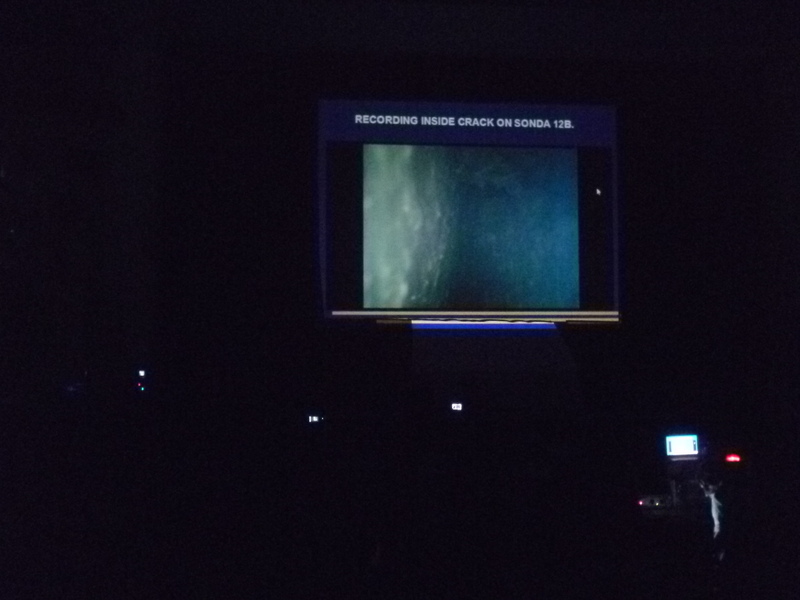 The footage was shown at the Hidden History Conference, which coincided with the end of my trip. During the course of my first week, I worked in a team of five, led by Octavio a charming structural engineer from Madrid. Our physical efforts were employed to expand the cavity and further expand the entrance to the shaft, all the while being considerate to the site and using the least destructive methods possible. 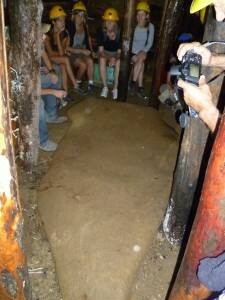 The significance of accessing this chamber is comparable to the so called King’s and Queen’s chambers in Egypt. The main difference between the Great Pyramid and the Pyramid of the Sun is that the latter has multiple chambers that spiral from top to bottom. If one chamber can be accessed, then it might be able to be compared with similar discoveries. In doing so, the relationship between pyramidal stone structures, which have hollows and tubes, to the magnetic fields of the Earth might be better understood. It is evident that Nikola Tesla derived many of his extraordinary findings and re-innovations from his extensive study of pyramids and ancient cultures. He was able to demonstrate a century ago that pyramids can generate power and were most likely, possibly among other things, were ancient power stations. Tesla recognised the original pyramids of Egypt as batteries with at least one component missing – most likely, as with all ancient pyramids, the functioning capstone. Our dig turned up many interesting finds and superficial inconsistencies. 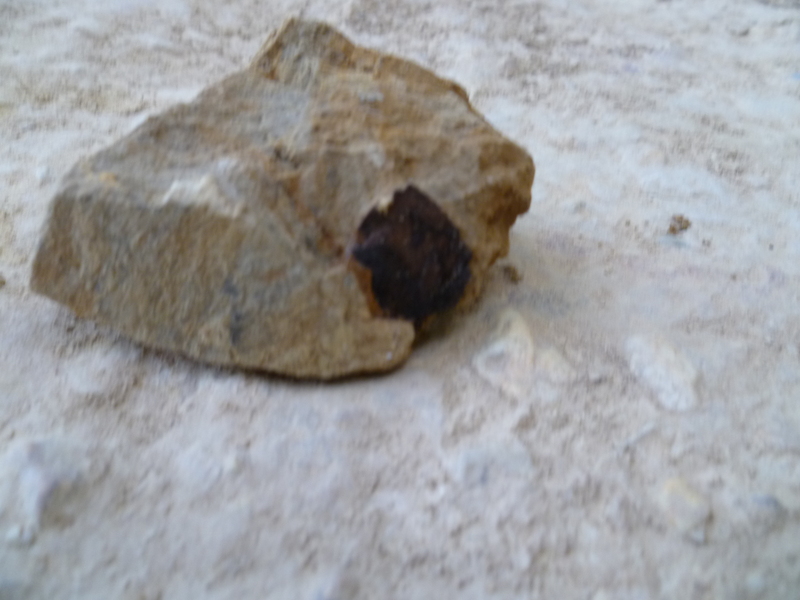 Pictured above is a slice of organic matter that can be used to date the layer we were penetrating. 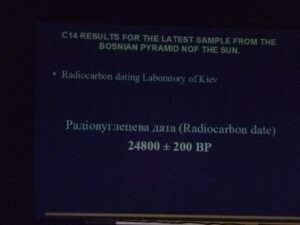 Similar examples have returned from the radiocarbondating labs of University Uppsala (Sweden), University of Kiel (Germany), University of Technology in Gliwice (Poland) with results that range from 25,000-40,000 years. 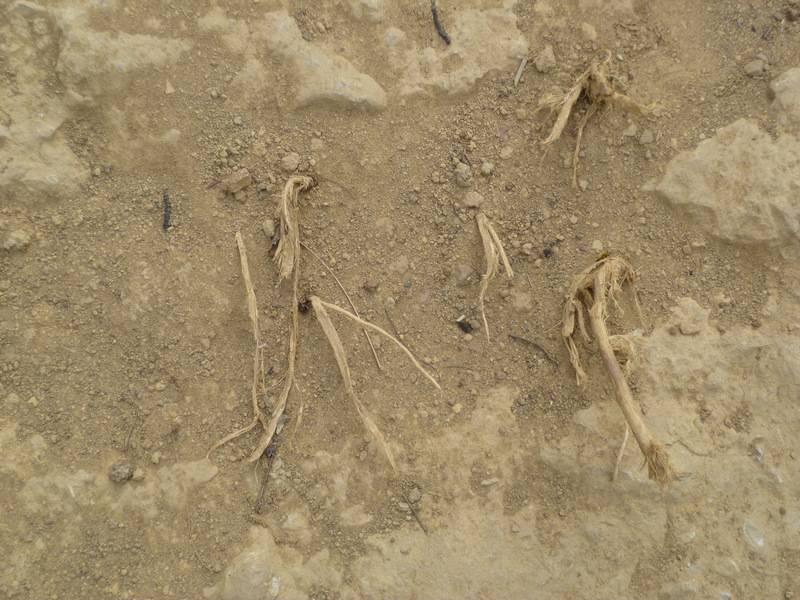 Obviously these dates are younger than the original structure upon which they have settled. It is already accepted by mainstream anthropological genetics that human communities have been present in this region for 35,000 years. We found veins of parallel, white quartz crystal (below) seams in the concrete, the regularity of which was eye-catching. This kind of stone makes an easier connection with the pulsation, the heartbeat of the planet; further compounding the idea that this pyramid was once designed to be a machine that harnessed abundant natural energies. During the second week our team was privileged to witness the famed dowser Larry Bird at work. 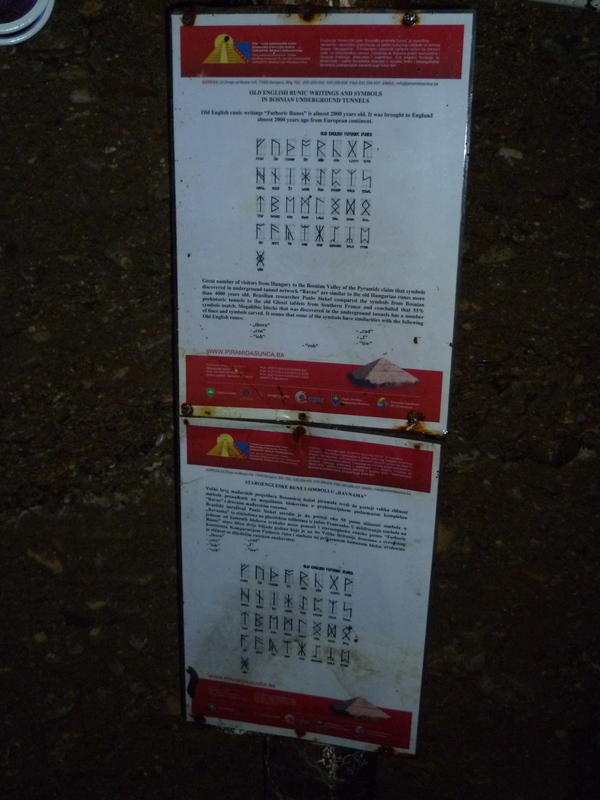 It was fascinating to see first hand how he read subterranean details. As he worked, the accompanying unbroken narrative was like a man reading a braille script. Larry is a man of seventy-one years who would show up most men with his brilliant stamina and intellect. His visit to 12-B coincided with the interest of an Austrian film crew who were in the process of filming for a documentary (seemingly adhering to the original definition, implying the end product will have some integrity). 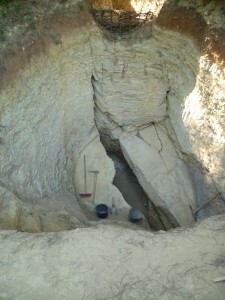 From the top lip of the excavation, especially on the warmer days, the cool air flowing purposefully out of the shaft’s crack could be easily appreciated, demonstrating the strong air circulation that exists within the pyramid. 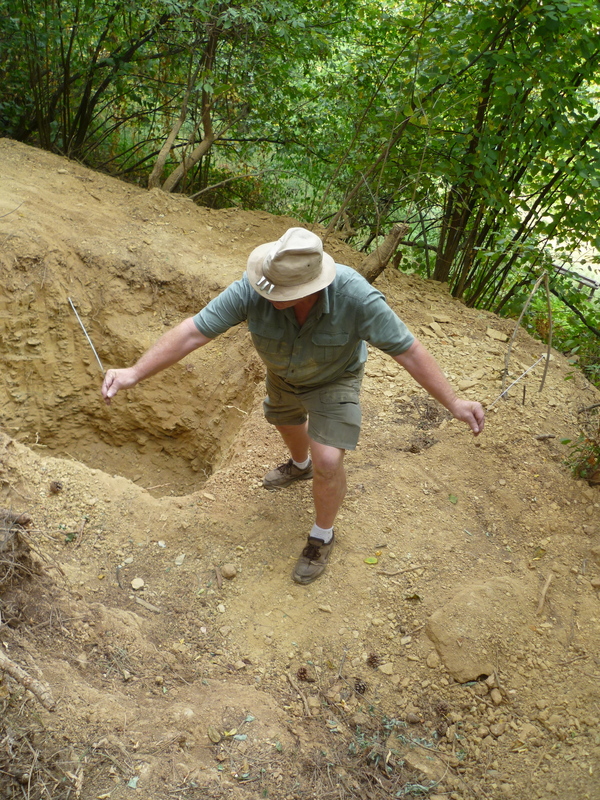 Larry’s Native American nose led him a little further east from 12-B to site 12-C. As his unceasing commentary continued he disclosed something, which our team was already privy to. 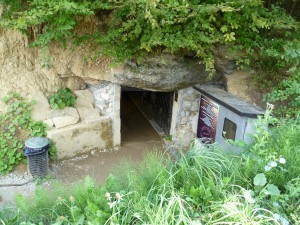 There was an ancillary entrance that fed in to the main one at 12-B. There was a mirror ancillary doorway on the west-side and a further two feeder channels above; the five points forming an “M” shape. 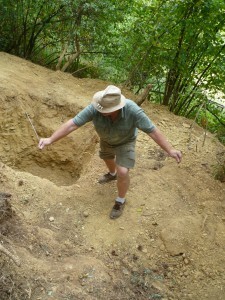 Larry’s dowsing was exciting and his skill encouraged us to turn our energies to 12-C. So the team was now reduced to a refined trio including Bjorn (Norway) and Staffan (Sweden). Our cheerleader was Immortal Technique rapping through an iPhone; this was the point of no return. During the course of the first week I was confronted with many artifacts that challenged. 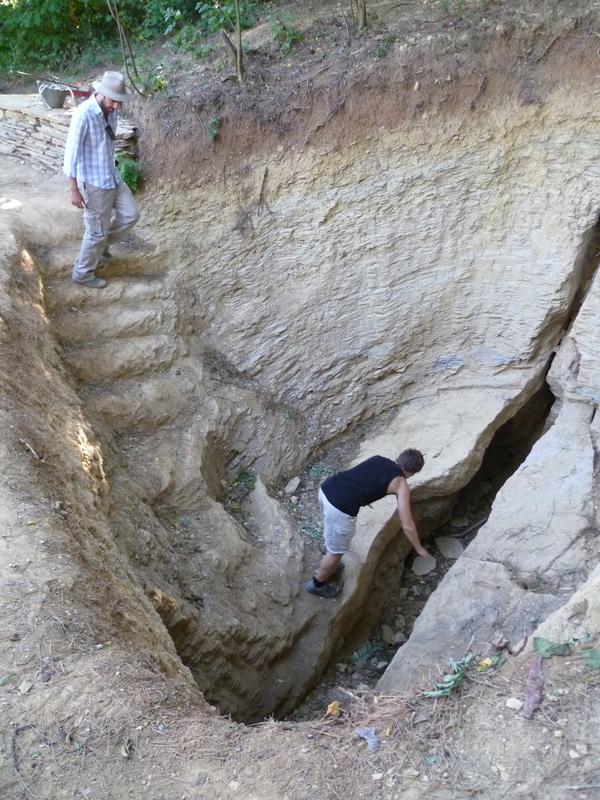 Once one goes deeper and investigates things can become a bit scary. Confronted with a version of history that for once resonates across perspective and dimensions. Relive the group memory of Earth’s past cleansing trauma and the cause of death of the civilisation that once thrived in the Visoko valley. This brand of archaeology is exciting. 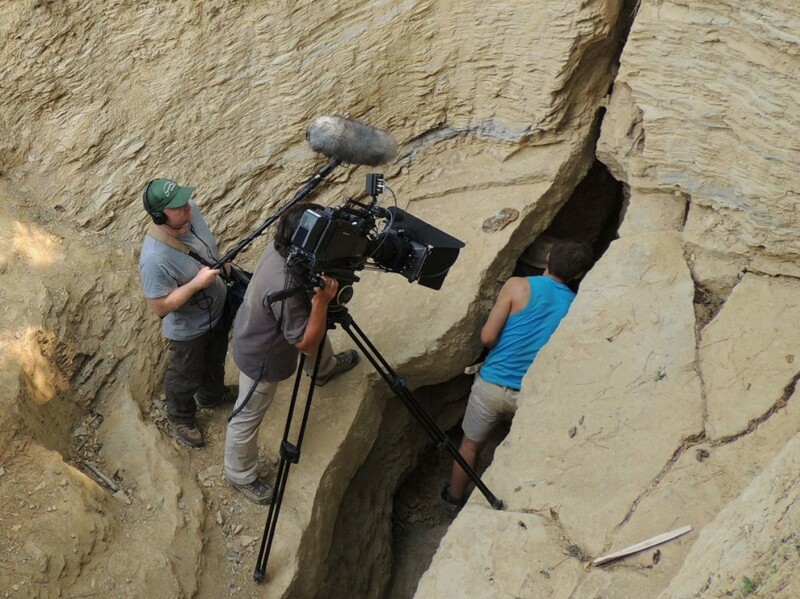 To be on the cusp of uncovering a monument that was at risk of being buried permanently. Is this not what the likes of Zahi Hawass ought to be applying themselves to? 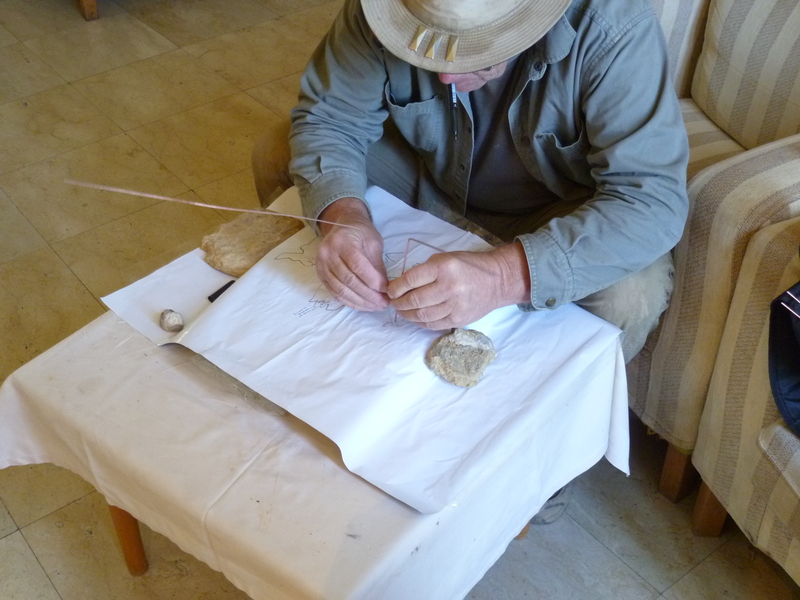 Of course there have been plenty of scornful rebuttals of thousands of archaeological revelations, by individuals entrenched in the archeological establishment. It is no wonder, because once they hint at an endorsement they would simultaneously undermine their academic sand castles. From the perspective of holding onto illusion one can partially forgive their futile resistance to the truth. It is interesting to note the type of groups interested in this valley, today and in chartable modern history. Not all are savoury characters; indeed there are representatives of both the extreme dark and the light. The story here is a fractal of so much being played out on Earth and a reflection of the life of Tesla, who breed so many freeing inventions only for them to be mothballed or used in angst by others. The Tesla revelation was certainly one of the most profound I would take back away from Bosnia. That his Wardenclyffe Tower used exactly the same principles we were uncovering in Visoko, only two hundred kilometres from the place of his birth. The use of magnetite at thirds and top to stimulate and project the strongest magnetic field. Vast waters beneath. 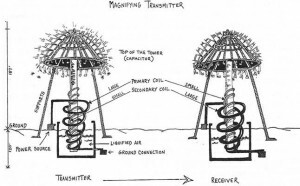 Spiralling chambers as transponders. The real question is, did Tesla reverse engineer and unlock secrets of the pyramids?! If he did, this would reduce the question many believe has not been answered beyond doubt. To what extent is the Pyramid of the Sun made by man or overworked by man? 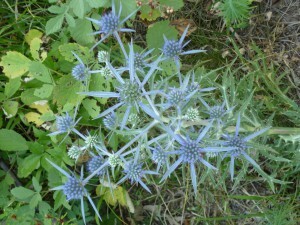 It is remarkable how much can be perceived from only scratching the surface of one site. It seemed to me that in asking the right questions, the pyramid amplified them and returned resounding answers, often ones least expected. I had one profound episode where I experienced an amplified personal communication from 1,500 kilometres away. Will we be offered a chance to redevelop abilities of super-sensitivity and the science of Atlantean priests and priestesses? 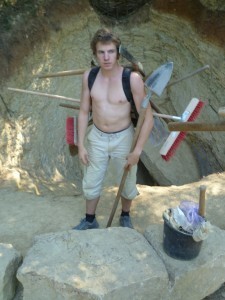 Occasionally, at the end of a six hour shift we would walk up the side of the pyramid. It was always such a great feeling to climb it and admire its angle and road cut into it’s side (above). In Egypt it has been illegal to climb since 1983. The angle on the Sun is the same and one would do well to avoid taunting gravity by walking vertically up and become exhausted by resistance or vertically down and risk injury when the momentum becomes unmanageable. 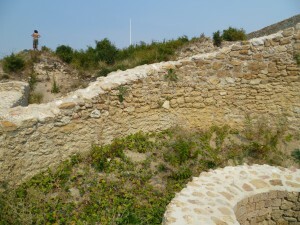 At the summit there is a restored Medieval settlement that reminded me of Old Sarum, Wiltshire, UK. where there are the remains of a castle once used by monarchs, positioned on a sacred druidic site. Between April and June 2010, physicists detected strong electomagnetic radiation. 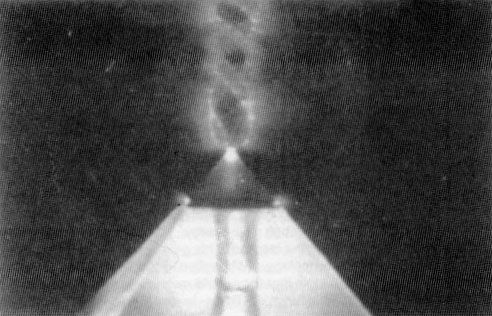 Specifically a beam four and a half metres in diameter that resonates at ultrasound; confirmed by physicist Slobodan Mizdrak (Zagreb) Dr Harry Oldfield (UK.) It moves at the speed of light and its strength is magnified by altitude, a contradiction of conventional physics. Although it would be even more difficult to accept that the beam comes from above. 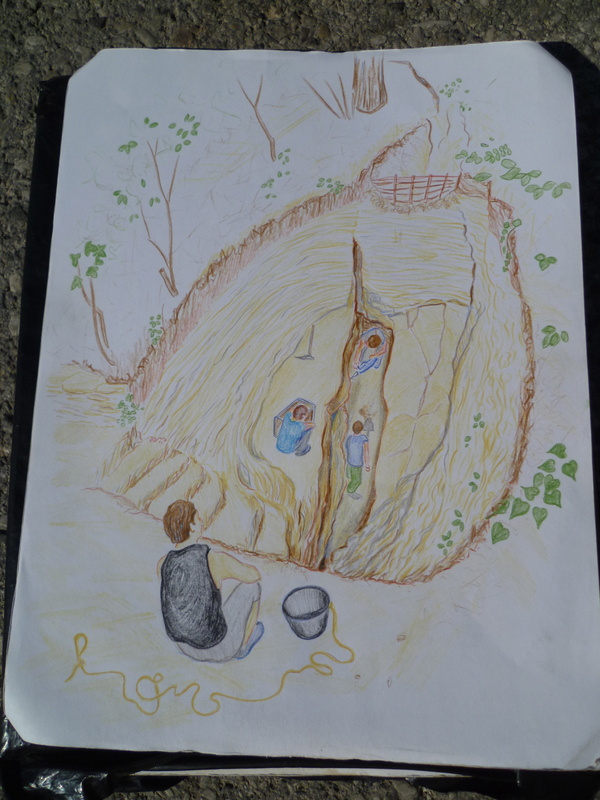 With my feet hanging off one of the summit’s walls, facing away from the North side it occurred to me that although we were digging toward an entrance perhaps we ought to be digging on the opposite side. 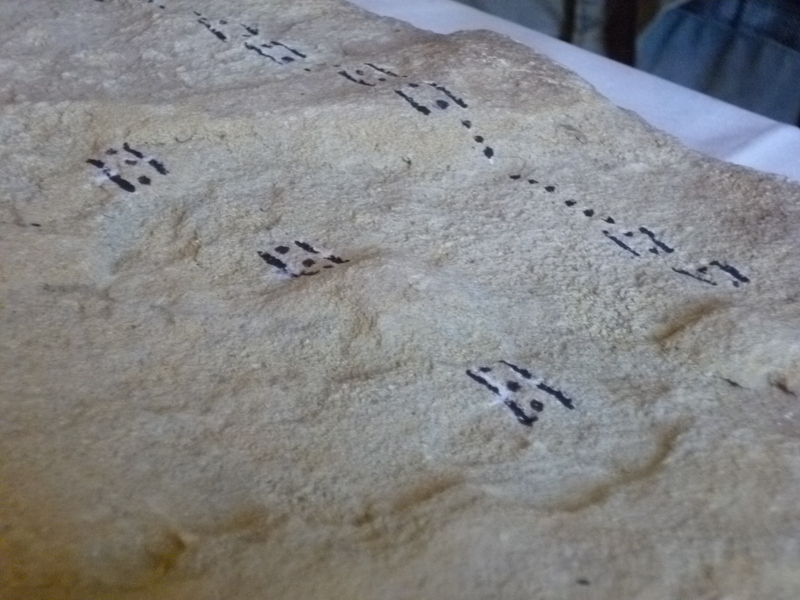 After all it is on this side where we find a plateau, perhaps similar to those found adorning the primary faces of some Central American pyramids. It is conceivable that two floors of time can be in equilibrium and that the pyramid might biologically balance these times. A mechanism not symbolism. Convergence of timelines as we cross ages of Pisces to Aquarius. I discerned this from just being there. 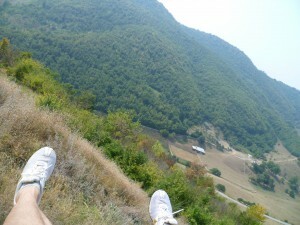 Ah, so this is what it is to have a view from the top. The view from the top was over a land unbounded by tamed beauty and I said “thank you,” for the lessons I have learnt of myself and those lessons I have learnt of others. 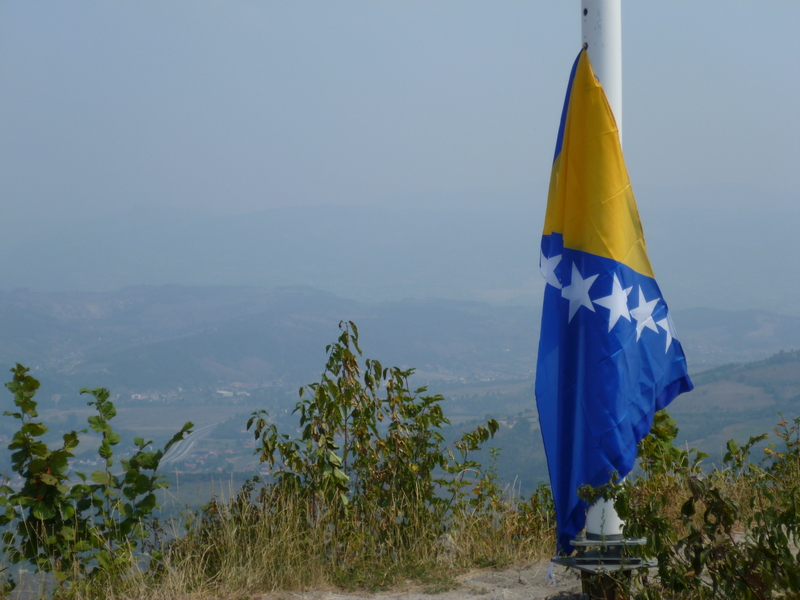 There is a pole at the highest point of the pyramid, too slippery to scale, so we fastened the flag of Bosnia and Herzegovina to the base before Americans thought it was looking bare. 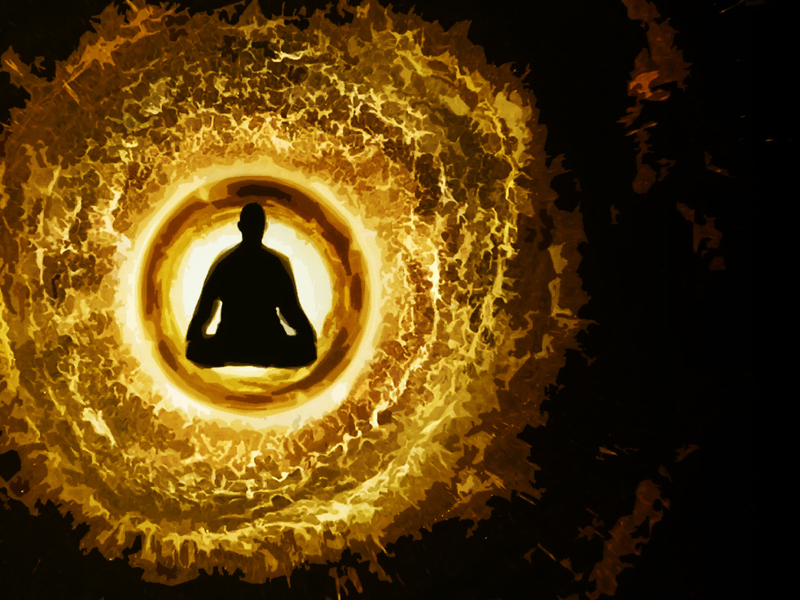 It is interesting to observe that we often complicate our world by seeking alignment with each other and in so doing ignore and forget to listen to the master within. 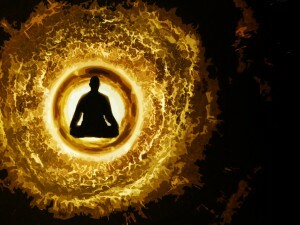 Listen to the master within! It is like coming home, you are not losing anything, in fact you are able to experience what you could not have imagined you could. 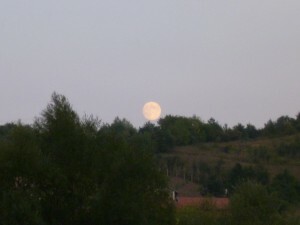 The full moon loomed before the big party of free flowing music and jollity. A celebration of the Pyramid’s will to bring us all together in this one moment, dispersed coals being warmed in the furnace of Visoko. 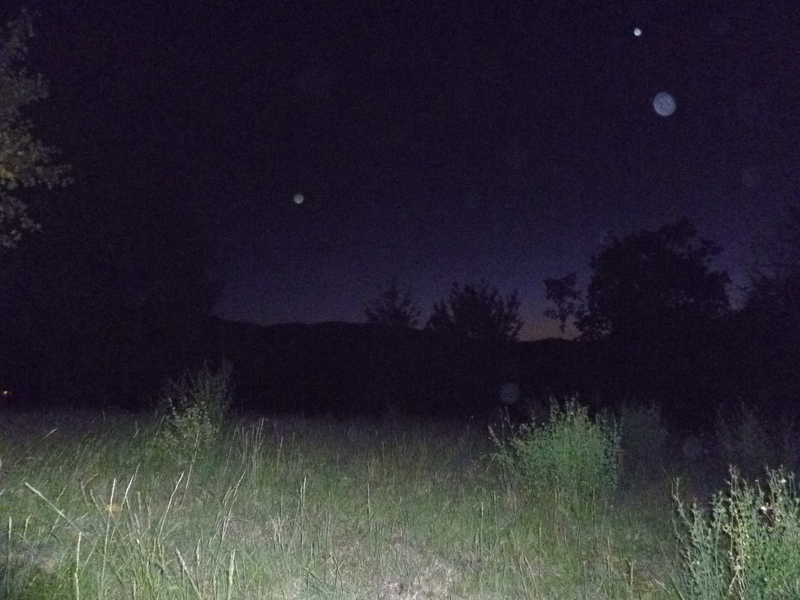 Other entities made themselves visible in orb form (below). The building blocks of the Pyramid of the Moon (below), which is situated on the opposite side of the valley to the Sun. The artifacts tell a compelling story. Below a small collection of stone and ceramics, pre-dating documented culture rescued from The Temple of Mother Earth where shallower layers tell tales of Greek influence built upon a neolithic settlement. 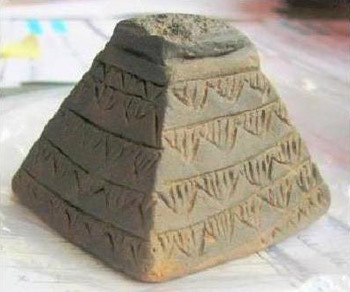 A series of six palm sized ceramic pyramids were discovered in 2008 by students from the University of Kiel (Germany). They shared striking similarities with scaled-down models discovered in Egypt. 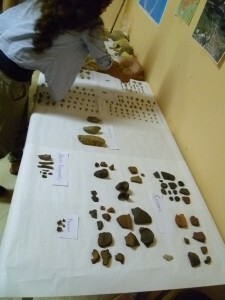 They have since been confiscated from the dig foundation by the acheological team from the National Museum of Bosnia and Herzegovina. Stone panel found on the access plateau of the Pyramid of the Sun. even in the weak image below it is possible to make out a replication of Visoko’s pyramid layout carved in the stone. Further adding to the accumulating evidence from researchers across the world that there was a global high civilisation that was, for all intents and purposes, wiped out approximately 12,500 years ago. Above, Larry Bird dedicated time to dowsing the stone panel and inscribed its code on paper placed on top of it. In a town of approximately 20,000 there is a disproportional presence of supranational and mercenary services. Puma helicopters, as pictured, fly regular rounds across the valley each day; monitoring and waiting. 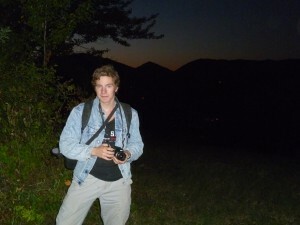 In the final days of my fortnight voyage I heard of an enchanted place nearby called Ginje, which has been embedded in local modern history since its use as a retreat for the pinnacle members of the Third Reich hierarchy. 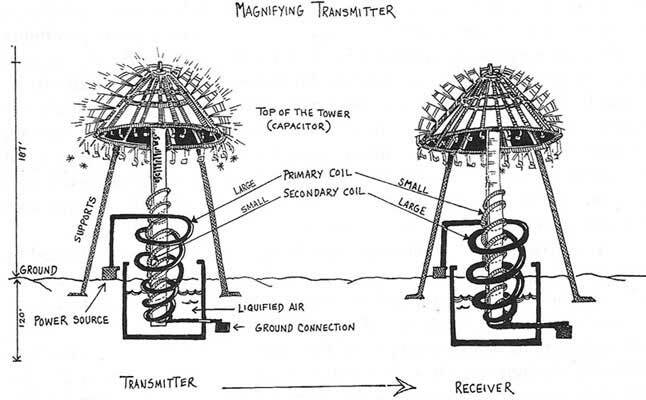 On this specific site emanates a strong spiralling energy vortex – again Tesla coil characteristics. 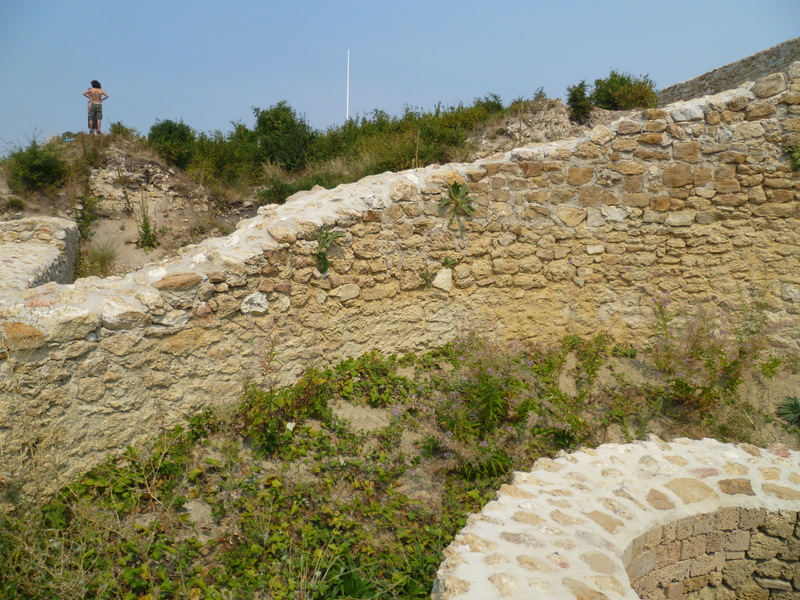 So as I accompanied Bjorn and Staffan, with other colleagues who had previously visited this site, we climbed a hill and on it levelling off my passiveness was suddenly superseded by an all consuming transfixion. It was as if something beyond the detection of my five senses was pleading for my attention. Unbeknown to me at the time, I was standing on the very location of the energy vortex. Even in my ignorance at the time, my subconscious was respectful of it and I patrolled the perimiter of the hill as others prayed. 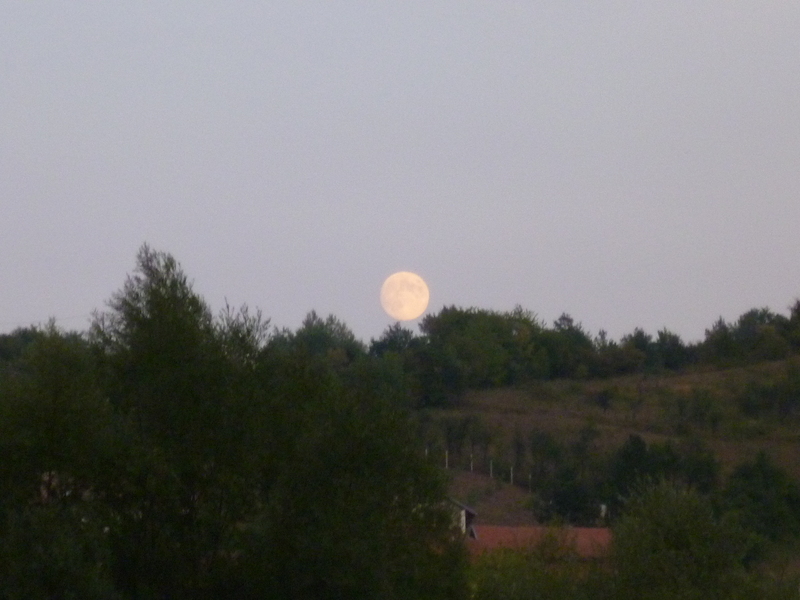 The Sun was setting but there was something more than a light incongruity in the distant landscape. Hills and Pyramids seemed to be swaying, like sheets on a washing line moving against each other. I had a strong sense that the world was telling me that it only exists when it is observed and even the observation does not tell the whole story unless properly decoded because the panorama itself is not entering the brain, it is being observed and as the point of observation changes so does that which is being deciphered. We are perception not objects. As I ventured toward the centre of the Ginje hill I could feel the intersection of energy sources being pulled in from every corner of the valley. It was two days later that I learned that at every 9.4 degrees from the centre-point of Ginje lies a major monument and that the longest tunnel detected by ground penetrating radar runs from the Sun Pyramid (pictured twice above) to this very hill, which is a known ancient burial site. So the significance of this modest looking hill was quickly coming into sharp personal focus. If its sacred might could be harnessed, it could also be abused. 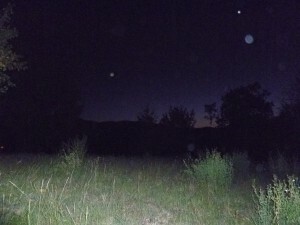 It was about now that I began to see sporadic white balls of light rush across the landscape surrounding the hill. At first only one every half a minute of so. The balls would leave a following trail, etching the scenery. 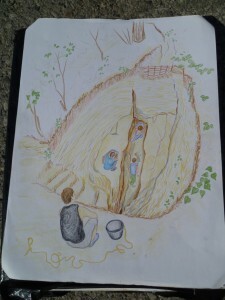 The best way I could describe it is by drawing a parallel with the Raiders of the Lost Ark scene when the Ark of the Covenant is lifted and pallid spirits emerge. It was a firm and adamant experience. A spiritual experience that I did not abuse by choosing to leave within only twenty minutes of arriving. I recognise it as a privilege and felt the presence of our ancestors flow through me, from behind, through, up and out of my physical body. It is time to remember who we are as a human race, who we really are. Not defined by our sub-economic roles. Our ancestors cry at our serfdom. They cry at our isolation from that which we are akin – each other. Time to recognise the sanctity of all life. That which co-habits the Earth, the Universe and the multi-dimensions beyond what we can decipher while dressed in the handsomely crafted physical suits our spirits walk around in. There is an unceasing intent to indoctrinate, for contemporary men and women to passively accept the grossest misallocation of capital in human history as an armada gathers off the shores of Persia – precipitating what has the hallmarks of the biggest overt terrestrial war ever. Let us choose to create positive modern novelty, let it originate from the depth of our common ancestry. There is still so much for us to rediscover and reconnect to. Here’s to this generation of young voyagers, quickly assembling the evidence and knowledge of good human potentiality, beautiful and meaningful research. It is the time to shift conceptuality to this reality. 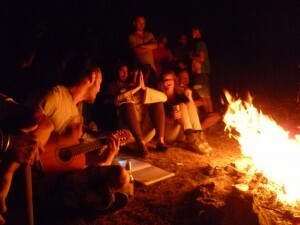 To reunite thinking and experience, determinism and intuition. Wonderful mix of personal experience and insights into possible technologies and mysteries. An inspiration to unite the mind and heart into a oneness of unlimited unity. 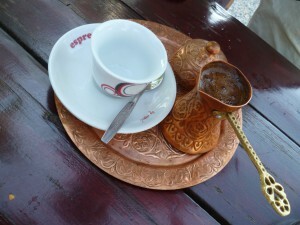 Thank you for supporting Earth and Humanity by visiting Bosnia. For some it might be a most illogical place to choose but for others one of huge purpose. Thank you for the wonderful sharing of your adventure. This is one place I have long wanted to visit and experience. I really appreciate your blend of researched information and intuitive interpretation of your experiences… it all gives me even stronger calling to visit. Your suggestion of a deliberate poisoning of the Earth’s energy architecture (ley lines etc) is totally conceivable in my opinion, and can be seen in the ‘system’s’ treatment of many other significant energy sites (such as Uluru in Australia, the many stone circles in UK, and locations such as Mount Shasta in Northern California) which are becoming increasingly difficult for real people/light workers to visit and experience and absorb. Thank you for your time and sharing! Hi , A great piece of writing dude. Very Eloquent, thorough and concise. Great article, pix, and links. Here’s another video you might be interested in. 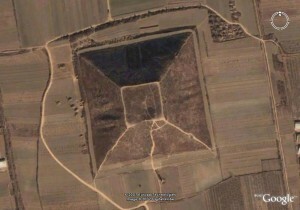 It shows the attempt in Summer 2011 to break through the extremely hard artificial concrete that covers the Pyramid of the Sun. A mechanical digger was used. This digger, which has no trouble breaking through granite, was unable to break through the last 60 centimeters of this ancient (heated) concrete. Italian lead archaeologist Sara Acconci often calls the concrete “concrete blocks,” but she means simply “concrete,” as the ancients did not pour the concrete in blocks per se. You have nice way with words, but few typos also. Probably from quickly writing. I point out that names of very important historical figures should be correct (Viktor Schauberger). I also disagree with some speculations you make, but altogether I enjoyed reading it and brought back lot of good memories. Thank you so much for bringing this to our minds eye. This is a great article with a lot of information, great content!